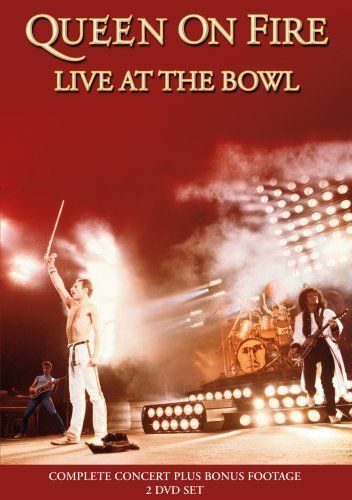 Queen will reissue “Queen On Fire: Live At The Bowl” on DVD and digital video on May 21. The set captures Queen in concert at England’s Milton Keynes Bowl on June 5, 1982, as part of the band’s Hot Space Tour. 170 minutes deep, this two-disc set has been extensively restored from the original sound and footage. Disc 1 presents the performance in its entirety, filmed by Gavin Taylor. Disc 2 features a wealth of bonus material, including interviews, a photo gallery, and bonus performances at Tokyo’s Seibu Stadium (November 3rd, 1982) and Vienna’s Stadthalle (May 12th, 1982). The interviews encompassed are a behind-the-scenes look at Milton Keynes as the crew preps the massive stage show, a chat with Freddie Mercury in Munich during the European leg of the Hot Space tour, and an interview with Brian May and Roger Taylor. The full package features more than 3 hours of Queen material. Backstage Interview – Behind the scenes footage at Milton Keynes as the crew put the finishing touches to the massive stage. Includes interviews filmed on the day with Brian May and Roger Taylor. Freddie interview. Filmed in Munich during the European leg of the 1982 Hot Space tour, Freddie talks about the Queen live show, and reflects on the band’s first ten years together. Brian and Roger Interview. Also filmed in Munich. Brian and Roger discuss the Hot Space album and tour as well as revealing why the band are still together after ten years.